Genuine Black PU Leather Flip Wallet Case Cover for iPhone 6 Plus/6S Plus with Free Screen Protector! Precisely Designed Flip LeatherWallet Flip Case is a perfect fit for your version of Apple iPhone 6 Plus/ 6S Plus. item 1 BLACK PU LEATHER FLIP WALLET CASE FOR iPHONE 6 PLUS WITH FREE SCREEN PROTECTOR!! -BLACK PU LEATHER FLIP WALLET CASE FOR iPHONE 6 PLUS WITH FREE SCREEN PROTECTOR!! item 2 BLACK PU LEATHER FLIP WALLET CASE FOR iPHONE 6/6S WITH FREE SCREEN PROTECTOR!! -BLACK PU LEATHER FLIP WALLET CASE FOR iPHONE 6/6S WITH FREE SCREEN PROTECTOR!! item 3 BLACK PU LEATHER WALLET CASE FOR iPHONE 5/ 5S WITH FREE SCREEN PROTECTOR!! 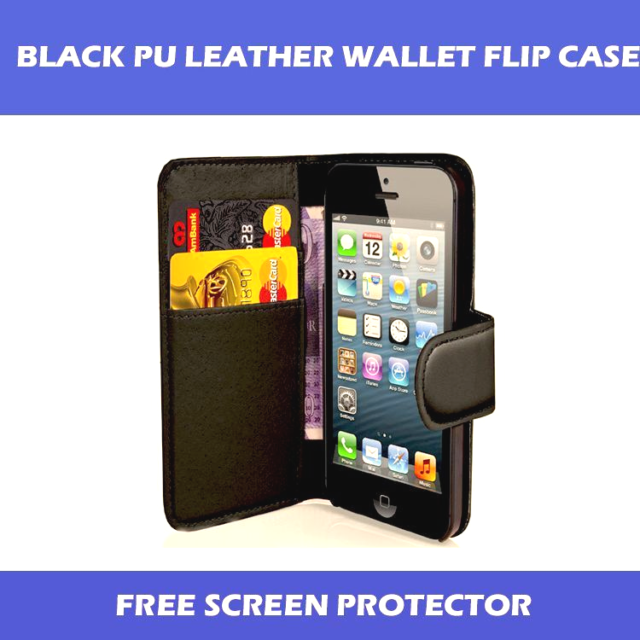 -BLACK PU LEATHER WALLET CASE FOR iPHONE 5/ 5S WITH FREE SCREEN PROTECTOR!! It’s perfect for what is required and the price is astonishing. It could be worth ten times more than paid for. It protects my iPhone and looks fab. Buy it. Overall this is a good case which offers good overall protection, it is ideal for fitting into your pocket without the worry of scratching the screen. Generally this is a good buy but doesnt have a long life durability.